Campania is one of the more traveled regions of Italy because of the many cities of interest there, most notably Naples and the most famous attraction in Campania being Pompeii. Campania is about 5,247 square miles in area has 551 towns and an overall population of 5,950,000. The region is 140 miles long from north to south has an average width in the north of about 60 miles and about 25 miles in the south and a coastline of about 155 miles. The capital city of Campania is Naples and notable cities in the region are, Sorrento, Salerno, Amalfi, Caserta and the isle of Capri. 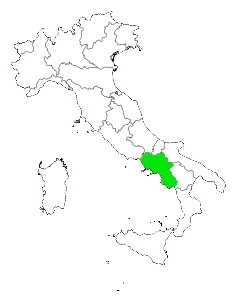 Campania has five regional neighbors which are Basilicata to the south east Apulia and Molise to the east Abruzzo to the north east and Lazio to the north. Even though Italy sticks out into the Mediterranean sea the part of the sea that Campania faces is called the Tyrrhenian sea. resorts with beautiful coves. Starting in the south the first beaches are near the town of Policastro Bussentino but are in very rocky coasts and seem to accessible only by boat. Then there is a nice resort area just south of Marina di Camerota with some nice sandy beaches for several miles followed by a little hit and miss with cliffs and rocky beaches. Then from the town of Santa Maria all the way up the coast to a little south of Salerno you will have a combination of long stretches of sandy beaches and cliffs with coves.